Dr. Diana McKnight (formerly Dr. Holcomb) is pleased to be opening her new optometry office in Elk Grove, California. Dr McKnight grew up in Elk Grove and is excited to be able to provide excellent eye care to the people of her home town. Dr. McKnight received her degree in optometry from the Southern California College of Optometry. She has worked closely with ophthalmologists and is fully certified to treat glaucoma. She has been an examiner with the National Board of Optometry for the past 6 years, and has been extensively trained to in all aspects of optometry, including ocular disease management. After graduation, Dr. McKnight was proud to serve as officer in the United States Navy at the submarine base in Groton, Connecticut. Upon discharge from the Navy, she purchased an optometry practice in Grass Valley, and spent 10 years providing the small foothill community with eye glasses, contact lenses, and the very best in professional eye care. Dr. Diana McKnight is an active member of Soroptimist International of Rio Cosumnes and a member of St. Peters Lutheran Church. She has two children, a daughter Elizabeth who loves to play soccer, and a son William who also likes to play soccer and will soon begin Lacrosse. 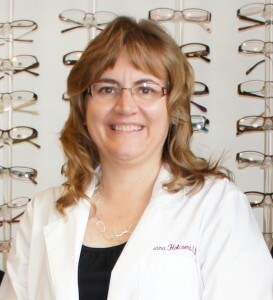 Please feel free to come by and meet Dr. Diana McKnight at her optometry practice in Elk Grove, Ca. While you are there you can meet the friendly staff and check out the latest in eyeglass frame styles. Dr. Diana McKnight's optometry practice is located at 8419 Elk Grove - Florin Road, Elk Grove, CA 95624 in the Bel Air shopping center. We offer extended office hours, including evenings and Saturdays, and accepts many insurance plans, including VSP.